2003 EL61 is a dwarf planet located in the Kuiper Belt that is more than half the size of Pluto and shaped like a squashed American football. A new study finds that an ancient collision shattered it into several fragments, some of which became comets that might have found their way to Earth. Pluto and its dwarf planet brethren have a new friend. The International Astronomical Union (IAU) announced thename of a new dwarf planet to join the existing four in the solar system. The object previously known as 2003 EL61 is now namedHaumea, after the goddess of childbirth and fertility in Hawaiian mythology.The name was decided by members of the International Astronomical Union'sCommittee on Small Body Nomenclature and the IAU Working Group for PlanetarySystem Nomenclature. The discovery of the odd, football-shaped Haumea was firstannounced in 2005. It was found by a group led by Jose-Luis Ortiz of theSierra Nevada Observatory in Spain, as well as a team led by Mike Brown ofCaltech, who was also behind the discovery of the dwarf planet Eris. Brown and his team initially spotted the dwarf planet inDecember 2004 just after Christmas, leading them to nickname it "Santa"due to the then-holiday season, the planet hunter wrote in a blog entry thisweek. The new name was suggested by co-discoverer David Rabinowitz of YaleUniversity, who believed it particularly apt since the goddess Haumea alsorepresents the element stone and observations of 2003 EL61 found it to becomposed almost entirely of rock with a pure ice crust, Brown added. Haumea joins Ceres, Pluto, Eris and Makemake as the fifthdwarf planet in oursolar system. Pluto was re-classified from planet to dwarf planet in 2006,following the discovery of Eris. The new dwarf planet has the same diameter as Pluto, but ismuch thinner, and contains about 32 percent of Pluto's mass. Scientists suggestHaumea's long, narrow shape arose from its rapid spin ? it rotates about onceevery four hours. Haumea is currently about 50 times as far from the sun asEarth is, but its orbit can swing it in as close as 35 times the sun-Earthdistance. It is part of the trans-Neptunian class of cold and rocky objects inthe outer solar system. Two small companion objects, thought to have been knockedoff Haumea's body by past impacts, keep the dwarf planet company. The twomoons were also re-designated with new names: Hi'iaka and Namaka, after the twochildren born to the goddess Haumea in Hawaiian myth. 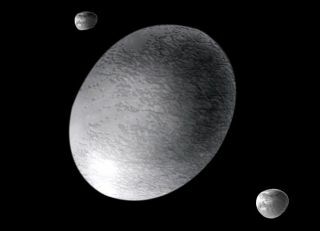 In the story, Haumea'schildren were created out of parts of her own body, just as the dwarf planet'stwo moons were apparently born out of itself.